The last Thursday in July is National Chili Dog Day! Making decisions is difficult. Alas, making decisions about what mouthwatering cuisine to satiate your appetite during the sweltering summer months can also be difficult. Do you want chili? Do you want hot dogs? Sometimes life doesn’t have to be so complicated. Sometimes you can have it all. Enter, like a shining beacon from the sky, the Chili Dog. On National Chili Dog Day, we the people celebrate a food that doesn’t make us choose. We celebrate a food that chooses us. We celebrate the chili dog. Chili shows up in the U.S. for the first time in San Antonio, sold by a woman by the nicknamed "Chili Queen"
We know cooking can be hard, what with all the directions and ingredients and the preheating of ovens. Guess what? Making a chili dog isn’t hard. The Internet exists for making vital tasks like these easier. We trust you can do this. Go forth and feast. Okay, you couldn’t make your own chili dog. That’s fine. No judgment from us. There are plenty of places of business where you can obtain an expertly crafted chili dog. Restaurants, amusement parks, food trucks, food carts, any of these establishments would be happy to serve you an exquisite globular shaped food with some sort of meat sauce poured on top of it. The world is your oyster and that oyster is filled with chili dogs. 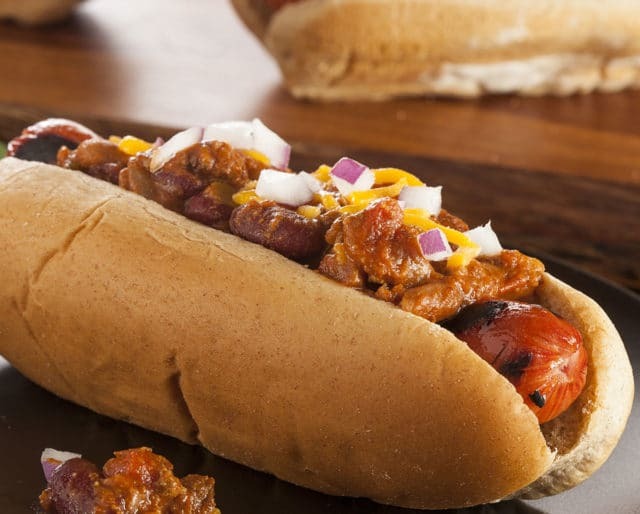 The birth of chili dogs came from the decision to bring unlikely ingredients together into one bun. It didn’t matter that the concoction hadn’t been produced before. It mattered that someone tried it. What if we did the same with people? What if we all came together like a chili dog in the name of chili dogs? What if the ultimate act of diplomacy was a party celebrating chili dogs? What if you had a dog and you turned the air conditioner on real high? Forget that one. Maybe just invite some friends over for really good food. No matter where you are or how you’re feeling emotionally, there is a chili dog out there for you. Want a classic? Load up on meat. Feel like like fortifying your bones with calcium? Stuff your bun with cheese. Are you skipping date night? Pile on the onions. No matter what your taste preference, the only wrong way to eat a chili dog is not eating one at all. Kale is fine. Quinoa is okay too. Wheatgrass? Good luck with that. Health trends and superfoods are great but sometimes you have to treat yourself to a food that you won’t find being touted at an overpriced juice bar. Chili dogs have earned a reputation for being one of the untidier “to go” foods. To some, this repute might make one less likely to fork over his or her hard earned cash. For us, the chaos that a chili dog can create on a plate, on a face, or in a stomach is a prerequisite to the kind of chow we deem worthy enough to scoff down.